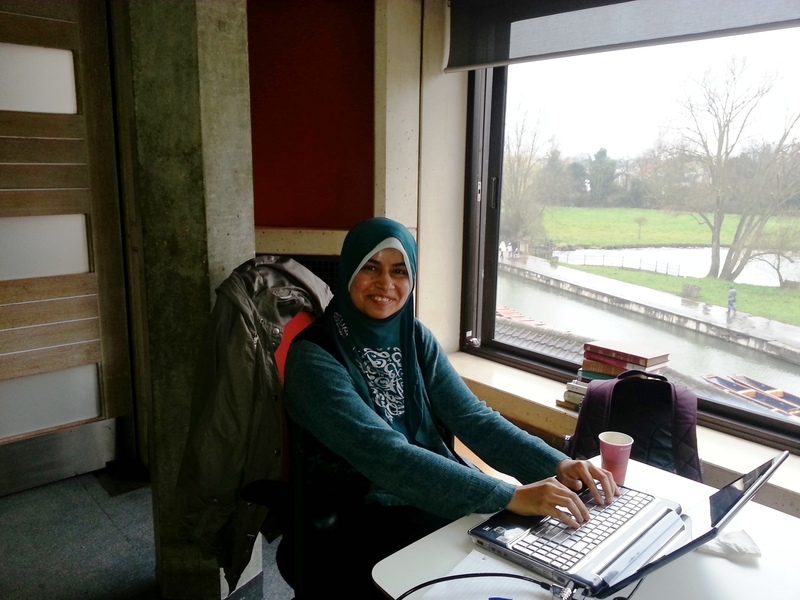 CRSC sits down with Dr Mona Jebril (PhD Education, completed 2017-18) to talk about her experience of studying at Oxford and Cambridge as a student coming from Gaza. Q: How challenging was your first journey to the UK? A: Travelling to Oxford was my first time ever travelling alone and I had never studied at a university in a foreign country. I was very excited but it was clear to me that this journey needed extra effort from me. There were fears. There were challenges along with excitement. I had to put all my energy into this opportunity because I couldn’t risk missing it. I got accepted and I got the scholarship. Then I got the visa. All of these stages were challenging in themselves. But then the border was closed so I still did not know whether I would be able to join my course on time. When we heard it would be open for three days, I went immediately but I still had to wait for two days on the border. And even when it was open, there were limited buses. It was so stressful. It very much depended on me to fight all these challenges. The university won’t help me. The government won’t help me. No one will help me. And then I remember standing in front of my college in a completely new context. Q: How different is academic life in Gaza from Oxford and Cambridge? A: The first thing my MSc supervisor at Oxford told me was not to believe everything written in a book. But in Gaza, there is very limited resources. We only had one or two books to read from for each subject so there is a huge dependency on textbooks. Here, you have a reading list with several books for every lecture and that exposes you to different views on the same topic. Also, the online system with subscriptions to journals – we did not have this in Gaza so I had to learn how to use it when I came here. Another thing is, many students here have high ambitions and many travel to go to conferences. But in Gaza, there is not really an opportunity to go out. There is a general frustration about unemployment. So people ask, ‘Why should we dream big?’ The war affects prospects for planning and being engaged in the academic community. It’s very difficult to establish cooperative academic networks, or even think of being engaged in world knowledge. Just looking for a job is a big dream in itself. It also affects dialogue. If you’re just meeting Palestinians it doesn’t expose you to different views. Of course, the world is now more connected through the internet but power cuts are common in Gaza. I had to take that into account when I interviewed Gazan students and academics for my doctoral thesis. I had to set up two provisional times for skype interviews and even switch between more than one device if the connection was interrupted. Q: How supportive was Cambridge during your studies? A: I received a lot of support from individuals. My supervisor was very supportive. However, there was no effort of inclusion from the system. It was not an effort of inclusion. I never received any sort of questionnaire asking about the experiences of students from conflict areas. It was as if all international students are treated in the same way. But there is a huge difference. One of my relatives received a scholarship to study in Turkey but the border has been closed since November. What is the university’s position in this context – for someone who has been waiting since November and even slept on the border? How can this be similar to someone who is coming from Amsterdam? Two wars also occurred in Gaza when I was in Cambridge. My neighbour’s house got bombarded and I think nine people were dead. It happened in the first term and then it happened again when I had to meet an important deadline in my second year. I never received any message from the college, faculty or university showing understanding of this. The only letter was the Provost from the Gates Cambridge Scholarship. There was no message of inquiry at all. Of course, my supervisor and I were in closer contact. But when something as big as this happens, of course you have to know. As a college, you have to know who are you students. And as a faculty and university, you also need to know. I tried to tell a senior staff member that conflict students deserved attention and she told me that ‘I was an adult’ so I should start my own discussion group focused on conflict zones. You feel there is a lack of undestanding. This is not the way universities should respond to this. Students in Gaza are completely on their own – from the start of their application process to coming here. I think the university really needs to talk about this. A message of support from the university can also make a big difference. At Cambridge, Mona has eagerly participated in a wide range of activities and events. Here, she’s handling AV equipment outside King’s College during a workshop on filming. Previous Previous post: Panel Discussion Part I: How do we support refugees in post-conflict transition?